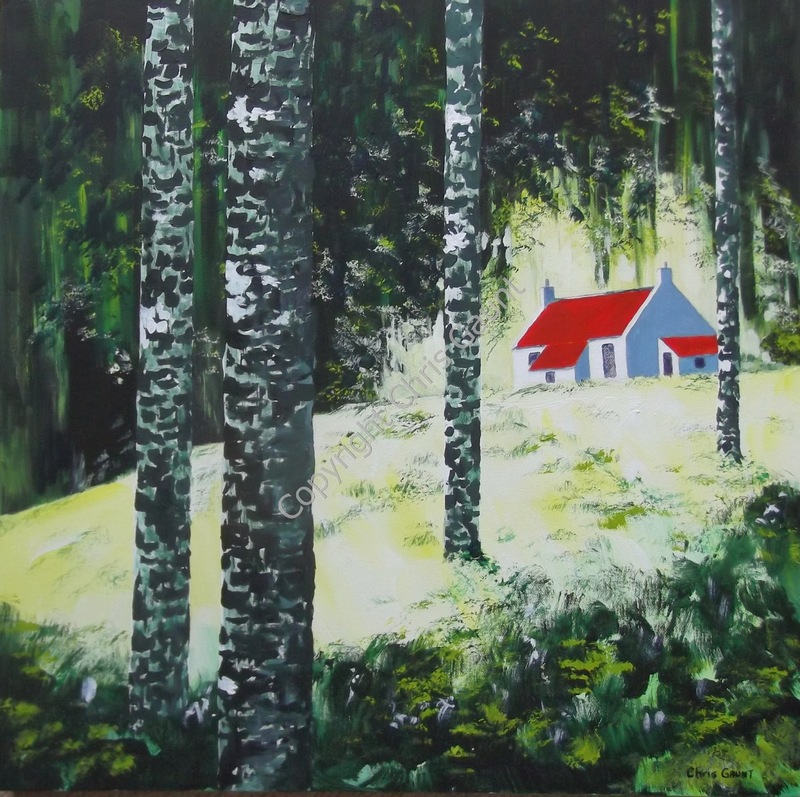 This is the fourth painting of Retreat Cottage. This one is Summer with the strong contrast of light and shade summer gives.The four paintings are all the same size 24" x 24" or 60cm x 60cm The other three, Spring, Autumn and Winter can be seen on Saatchi on Line. Am I crazy? My fellow Buddhist practitioners would ALMOST certainly think so and the wider world certainly would. 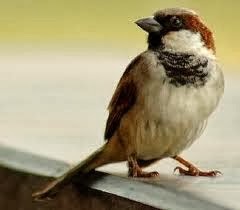 I have talked before about the little Sparrow who sits on the gutter above my front door, always in the same place looking down at me. I call him ( for it is a he ) my Guru and I feel a profound love for him. Why is this? Well almost all my enlightened moments, mystical moments, peak moments, call them what you will. have occurred in nature. I have had what seemed to me mystical moments and these have happened completely out of the blue, always in nature, always alone and never sought. Duality just dropped away and I was at one with my surroundings. What were these experiences? I have meditated for years, been on the path, talked about enlightenment, understood intellectually the 51 mental events identified by the Abhidarma scholars.but I am not enlightened, That is to say in the sense that I am in the constant state of bliss which we seem to be aiming for.. It has to be said also neither are any of my fellow practitioners, as far as it it possible for me to ascertain! The trouble is that there is no path to follow and we are still caught up with this idea. We study, practise and in some Buddhist groups pass a series of tests until we are considered worthy enough to be given a funny name. We are then admitted to a sort of hierarchy and are expected then to initiate less ' advanced ' beginners along the same ' path ' Does this miss the point? There is a line in the Heart Sutra which reads ' Attainment too is emptiness ' So what are we striving for? This mysterious thing called enlightenment? Anybody can have the kind of experience I described above and you don't have to be a Buddhist. Just stop trying! This is not to say I am recommending anyone to give up on Buddhism, I am not. Meditation will at the very least make you a happier more integrated person and most importantly if you join a Sangha you will benefit enormously. Thich Nhat Hanh said the Sangha is holy, even if some people in it are not! So I am happy to give up trying, to just be, and be open to my Guru, be it the Geese flying over on migration, a flower or my little Sparrow. So some will think I am crazy and some will get it. There is a famous Zen saying by Hsin Hsin Ming ' Before enlightenment, chopping wood and carrying water. After enlightenment, chopping wood and carrying water'. Of course these days we have to find the rent and attend to emails and facebook as well! Another acrylic ink painting. Looks better in the flesh so to speak! I don't know why but some paintings show more background material though the paint than others when photographed. Nevertheless I enjoyed the simplicity of this painting but don't think it is good enough to upload to Saatchi on line. Over Christmas and New Year I spent time with my two brothers in France. As previous readers of my blog may know my brother Tony is a fine artist. A lot of his recent work has been with acrylic ink. This is a medium I hadn't used before so I took the opportunity to experiment with some of Tony's paint. This loose interpretation of poppies is one example. While I was there Tony sold a painting on Saatchi on Line. It was this one if you are curious.